MANILA, Philippines, August 15, 2012 (ENS) – The Chinese government should establish a “green taxation system” to attain its target of reducing pollution and promoting sustainable economic growth, the Asian Development Bank advised today in a new report. In “Toward an Environmentally Sustainable Future,” the Manila-based lender recommends that the government impose taxes on resource extraction and pollutant and carbon dioxide emissions. The report acknowledges that over the past five years, the People’s Republic of China, PRC, has increased investment on environmental infrastructure, focused more on achievable targets, and strengthened accountability and enforcement. As a result, chemical oxygen demand and sulfur dioxide emissions were reduced by 10 percent and energy consumption per unit of GDP was cut by nearly 20 percent despite continued robust growth, the report finds. But China faces potential crises in water pollution, water scarcity, and solid waste, as urban and industrial wastewater treatment and solid waste management remain major challenges, the bank warns. Nonpoint source pollution, including fertilizer runoff, pesticides, and discharges from livestock facilities, threatens the aquatic health of lakes and estuaries. “The PRC’s environmental challenge is arguably the most complex that any country has confronted,” said Robert Wihtol, director general of the bank’s East Asia Department. Addressing these issues will require innovative strategies, regulations, and economic incentives, the bank advises. The report points to four root causes behind China’s environmental situation: the rapid pace of economic growth; the economy’s heavy reliance on exports and investment; the country’s strong dependence on coal; and rapid urbanization. To change this unsustainable growth pattern, the Asian Development Bank is urging the government to reform the pricing of resources and introduce a green taxation system. “This would tax resource extraction and pollutant and carbon dioxide emissions, and allow tax deductions to offset investments in pollution control equipment,” the ADB said today in a statement. 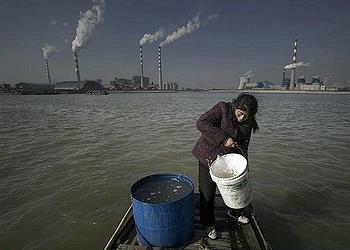 The report encourages the Chinese government to invest in natural resources. It calls for a national regulatory framework of “eco-compensation,” an initiative where the government or private sector pays households, communities, or local governments who protect natural resources that provide ecological services. “In developing a national eco-compensation ordinance, the government needs to evolve from being the main purchaser of ecological services to an ‘enabler’ that encourages private sector participation,” the bank advised. “Toward an Environmentally Sustainable Future,” the bank’s second environmental analysis of China, provided key inputs to the country’s 12th Five-Year Plan, covering the years 2011-2015. Under its Country Partnership Strategy for China covering the same years, the bank supports the government in pursuing clean and sustainable growth; prioritizing renewable energy and energy efficiency; encouraging low-carbon transport systems; protecting degraded rural ecosystems; and developing livable cities.